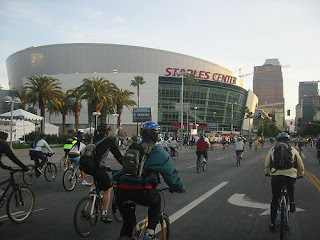 I went on my 5th consecutive Los Angeles Bike Tour this morning. I woke up at 3:50 AM, picked up a friend at 4:15 AM and then met 2 more friends at 4:30 PM in order to get to USC for the 5:50 AM start time. 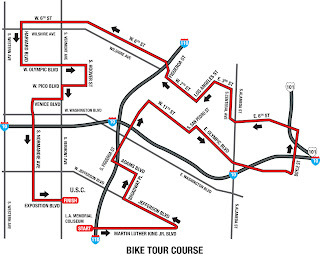 I tried to park in my normal spot on King Blvd just east of the 110 freeway, but there was no parking allowed there this time because the route changed this year and the first part of the ride was along King. I ended up paying $10 to park in a lot. I was really happy they changed the route this year. It was an opportunity to see new Los Angeles neighborhoods. The ride started and ended at USC again, but the majority of the ride was east of downtown this time. 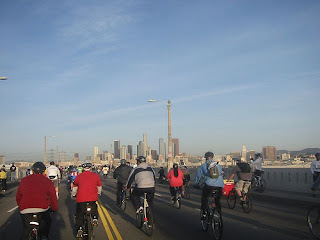 We rode as far as Boyle Heights and took in some awesome views of the downtown skyline as we crossed the LA River coming back west. Riding within downtown was also nice. A lot of downtown reminds me of New York. The new route flowed a lot better this year. There were very few narrow streets which ended up being bottle necks in years past. That being said, there seemed to be more accidents this year. I saw at least 5 cyclists on the ground getting help from security. I also saw one road biker whose front wheel got stuck in a narrow rut in the street. Every year, I'm amazed at how many people show up for the ride. 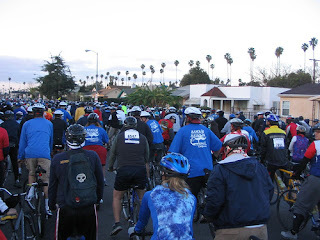 It is rumored to be the biggest organized bike ride in the USA at about 15,000 cyclists. It is one of the few events that brings the people of LA together for a day. We finished the ride at 8 AM and then picked up our medal, water, gatorade, fresh apples, and cookies that were being handed out in front of the Natural History Museum. Finally, we headed back near home to have some coffee and bagels at the Rumor Mill.